We have updated our website to provide you a better navigation experience. The content you are looking for may not be available at this address. 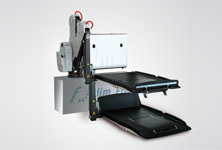 The new Fiorella lift fits both large and small vehicles and is the perfect synthesis of functionality, safety and ergonomics. Weight and dimensions are minimized to fit modern cars, offering an unprecedented level of lifting for people in wheelchairs. 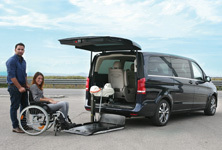 Easy=Safe is a new concept in transportation of wheelchair users developed by Focaccia Group to maximize safety by improving care giver’s inclination to a correct use of all the safety devices. Fiorella Slim Fit can be installed on a wide range of vehicles ensuring safety and reliability as well as the harmonious integration with the interiors and the exteriors thereof. In this gallery you can view our product-related videos and Fiorella accessories, discovering how they naturally and easily work and meet your needs.